AB is now eating with us for two meals a day (she is usually asleep during breakfast early in the morning before big sis goes to school.) We don’t make any dedicated “baby food” for her– due in part to the hassle and also to her outright refusal to eat bland purees. She sees what the rest of the family is eating (yes, she is watching) and insists (loudly) that she get to enjoy the same. She also likes to feed herself so there is usually a huge mess. But she LOVES to eat so it’s impossible to be upset! Besides WHAT she was eating, another stress for me was worrying whether or not she was getting enough vital nutrients. Her pediatrician (very kind and good with the baby) is a little old school and still pushed cereals as the first food since they are fortified with iron (we started with fruits and veggies instead.) At every visit he reminds us that breast milk does not contain enough vitamin D or iron after the first six months. He recommended vitamin D drops as well (manufactured by a large formula company), but I had a real problem with the ingredient list. Polysorbate 80, Artificial Caramel Coloring, Artificial Flavoring (so you have NO idea specifically what this is)– my adult vitamins don’t contain any of these things, so why should baby vitamins have so many additives? I figured it would be better to do a little research on real foods that contain high amounts of these nutrients and feed these instead. I’m not a total hippie mom– I say YES to vaccines and I use disposable diapers– but I DO think that it’s best to stay as close to nature wherever possible with regard to what we ingest. 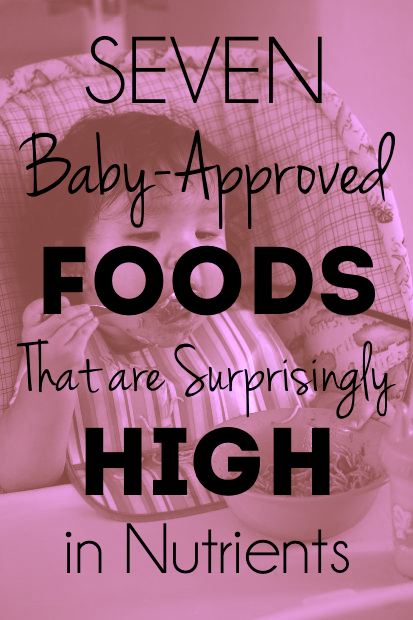 After some reading, I found that most of the foods we eat as a family are nutrient-dense, so if AB has these in addition to her breast milk (which is still the best thing I can provide her at this age), she should be good to go! Here are some of her favorites, as well as what key vitamins and minerals they contain. You might be surprised! Salmon – AB LOVES salmon! In addition to protein, omegas, and good fats, salmon has a TON of vitamin D. Awesome! Beef – We just started feeding AB ground beef (so it is easy to chew). She went crazy over last night’s spaghetti and meatballs. This is an amazing source of iron as well as protein. Bananas – I cut a banana in half and let her go to town. She loves to hold it in both hands and gnaw on it. Vitamin B6, vitamin C, potassium, and fiber are just a few of the benefits. Bananas have a bad rap for causing constipation, but some research shows that they actually have the opposite effect. I can attest that AB eats them regularly and definitely does NOT get stopped up! Broccoli – We have broccoli often in stir-fries and other dishes. I’ll usually give her a floret that she can hold and bite off smaller pieces. Broccoli is full of vitamins, and though it doesn’t contain much vitamin D on its own, it is said to help with vitamin D metabolization from other foods. Chicken – AB is obviously a carnivore– runs in the family! She will eat it in all forms, from chicken salad (yes, with a little mayo) to Cuban mojo (citrus garlic roasted.) Chicken is extremely high in protein, contains ALL B vitamins, and is a source of iron. Mushrooms – Mushrooms are perfect to toss into a variety of dishes as they easily absorb flavor. Mushrooms (the various types will differ in the exact amount) provide LOTS of vitamin D, B vitamins, antioxidants, AND iron. Who knew?! Sweet Red Bell Peppers – Yep, peppers! They are like nature’s multivitamin, containing traceable amounts of over 15 vitamins and minerals. Those are just some of the foods we eat on a regular basis. Hopefully you got some new ideas! Or, if you’ve already tried these, maybe now you know a little more about the great health benefits they offer. If we come across any other hits, I’ll post again! Happy eating! *I want to note that I am obviously not a medical professional and my suggestions are just that: suggestions. Always do your own research and talk to your pediatrician when trying new foods. Have you tried any legumes? I know you said she does not like purées – what about hummus? I have puréesd garbonzo beans and Liam loves them. You could also do edamame. Or even any other kinda bean (just smash each one with a fork to soften). There is also mixed reviews about peanut butter (creamy of course) Liam loves it! And yogurt!! We will slowly start introducing some of the animal proteins you mentioned – I’m pretty sure he’s going to love them!! He is just turning 6 months but loves to eat!!! Oh yea, disclaimer disclaimer disclaimer 🙂 love yours at the end….Happy Eating! Do you mix the peanut butter into things so it’s easier to eat? I’ve also been reading things that it may be better to start the on PB early instead of waiting. Hummus is a good idea…I bet she would love it! Even though it’s a puree it has a ton of flavor. Ava is also a major meat eater! Any favorite foods you recommend? We’re always looking to try new things! She loves pot roast, tilapia, quesadillas with chicken, actually the only thing she’s not that into is bread! Oh well, bread isn’t exactly good for them anyways 🙂 Quesadillas are a favorite of big sis so maybe we will try those soon.